This week the temperatures got above freezing for a couple of hours on just one day. Brrrr! It's definitely time for stews, chili, and soups. 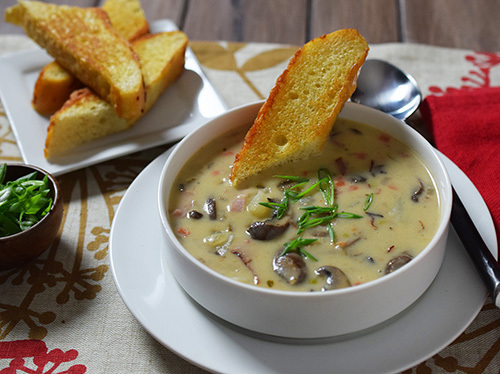 I whipped up this Potato, Mushroom, and Ham Soup to ward off the chills earlier this week. It is a roux-based soup using leftover ingredients that I had on hand. We had over-bought for the holidays and needed to use this stuff up anyway. 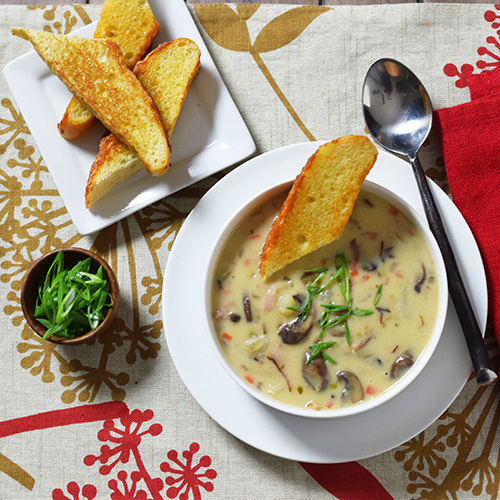 Soups are perfect for dealing with leftovers. The thin sliced smoked ham creates a slightly smoky flavor but nothing dominant. I also add a little cream at the end to make it creamy but not so much that it ventures into "cream of" territory. I thought about making some croutons but went with some griddled pieces of focaccia bread instead. Add 1 tbsp butter and saute the onion, carrots, and mushrooms until tender, about 8 minutes. Remove and keep. Add remaining 4 tbsp butter, melt and whisk in the flour to make a roux. Add the stock in small batches (a quarter cup or less) while whisking continuously. Wait to add more stock each time until the roux and stock blend. Bring to a simmer, add the potatoes, salt, peppers, garlic, and thyme. Simmer for 20 minutes. 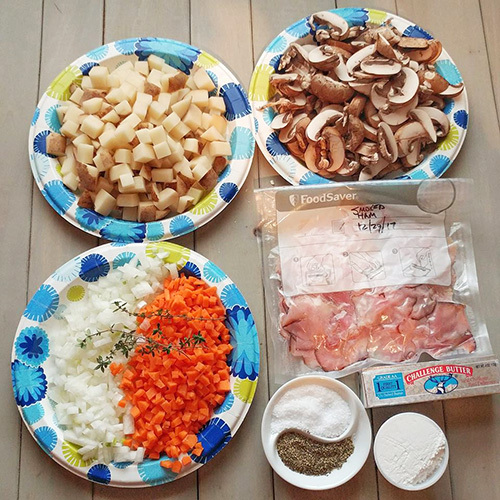 Add the carrots, onion, and mushrooms. Simmer for 10 minutes. Remove the thyme stems, as the leaves should have mostly fallen off by now.